While we've been desperately trying to cool off during this heat wave, a chilled-out Siberian husky has definitely one-upped us. 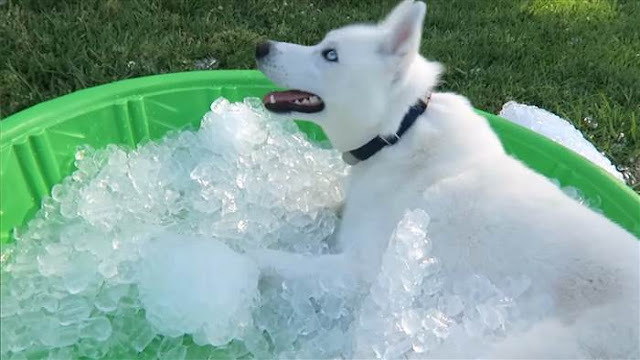 In a video posted to YouTube, the fluffy white pup, named Luke, gets his very own ice-filled kiddie pool to beat the heat. The lesson is: Use whatever tools are at your disposal to keep cool! At first, Luke cautiously jumps in and out of the tub — until he realizes its sweet, cooling benefits. Keeping cool TIPS: While it is important not to shave or cut your Husky’s fur, be sure that you still brush it regularly. Huskies should start shedding when the hot weather hits, so make sure to regularly brush your Husky to remove any excess fur that would keep them from cooling effectively. Huskies need a lot of special attention during the hot months but if you keep an eye on them, try to keep them cool, they’ll be fine just fine. Responses to "Siberian Husky Freaks Out Over A Kiddie Pool Full Of Ice"